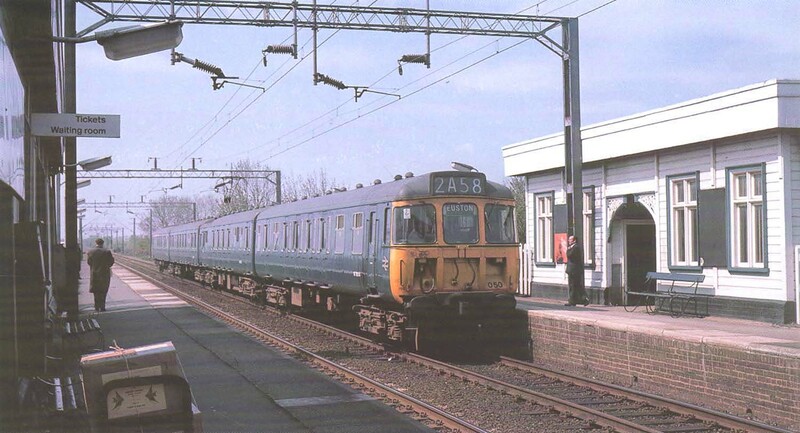 A Class 310 Electric Multiple Unit is seen arriving at Marston Green on 14:40pm semi-fast New Street to Euston service on 6th May 1975. The 310 Class was a slam-door, AC powered Electric Multiple Unit introduced in 1963 as part of the West Coast Main Line electrification project. They were initially classified as Class AM10 units before the introduction of the TOPS classification system. Constructed at BR's Derby Carriage and Wagon Works. They consisted of four carriages: a second class driving trailer; a second class trailer; a second class motor car - with guard's and luggage compartment above which the Stone Faiveley AMBR pantograph was mounted - and a First and Second Class composite driving trailer. The Class were limited to a maximum speed of 75 miles per hour. A glass partition behind the driver's cab enabled passengers in the leading and rear coaches to have an excellent view of the line ahead or behind. The original livery was overall Rail Blue, as seen above, later amended to a blue and grey colour scheme. Initially they were primarily used on local services from London Euston to Bletchley, Milton Keynes, Northampton and Birmingham, and within the West Midlands. They were also the first EMUs to be based on the British Rail Mark 2 bodyshell, which featured semi-integral construction.